So…what’s the first thing I do when I get to Texas? Yup. BBQ. My flight got in to DFW a few minutes ahead of schedule, so I was in town by 7:00. I had a lot of luggage with me and I still needed to figure out where to get my car. DFW is a pain because you have to shuttle to the rental car center. I had about 130 pounds of baggage and lugging them first downstairs and then to the shuttle stop was exhausting. When I got to the rental center, there was a line of incompetent people in front of me. It took way too long for people to figure out what they needed to do to rent a car. The whole process took over an hour so when I finally hopped into my ride for the week, I really just wanted a Pepsi and some brisket. I was staying at the Omni Dallas downtown. I didn’t really want to do a big sit down thing for dinner, but I wanted to grab something along the way. 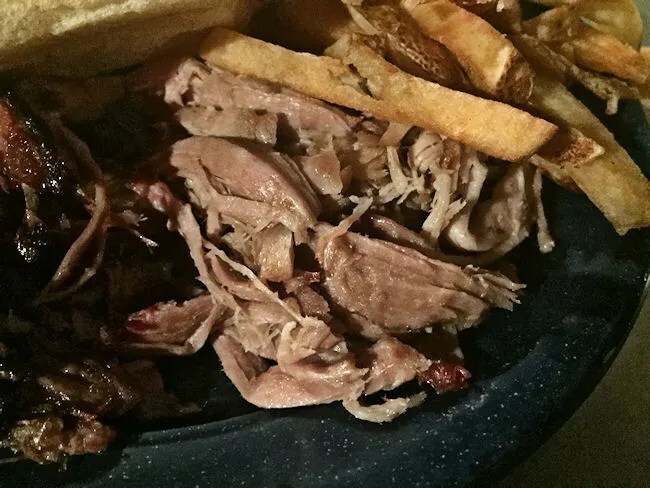 Of course, I researched BBQ places on my drive from the airport to the hotel and I found a quick service 24-hour restaurant that had great reviews. 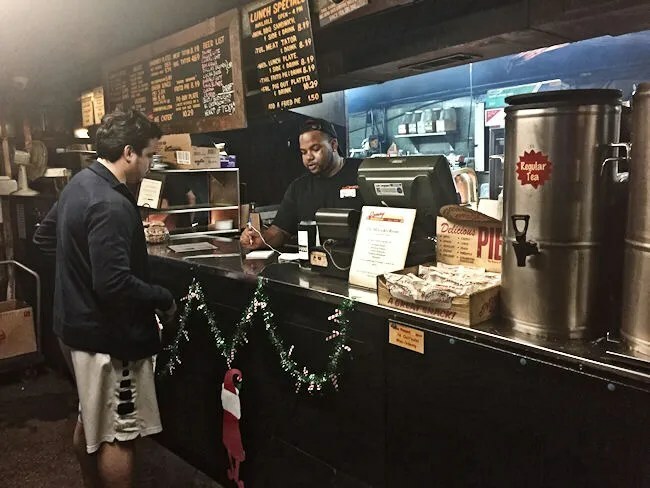 Sonny Bryan’s Smokehouse is a small chain in the Dallas area with seven locations…but all chains have to have an “original” and the original is usually something special. Sonny Bryan’s is no exception. 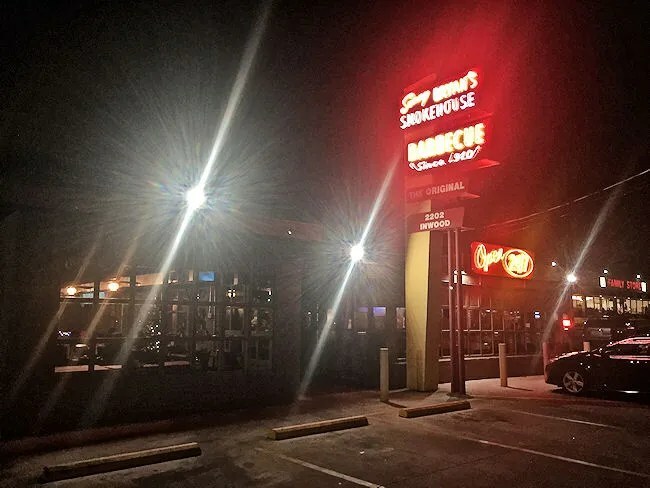 The Original Sonny Bryan’s Smokehouse is on Inwood Road just north of Interstate 35E in Dallas’ Oak Lawn Neighborhood. It’s kind of surrounded on all sides by UT Southwestern Medical Center and that’s actually part of the reason this location went 24 hours. This building has been in operation since 1958 when William Jennings Bryan, Jr, or Sonny, opened the restaurant. The family history of BBQ goes even further back with Bryan’s grandpa opening Bryan’s Barbecue in 1910 and his father opening Red Bryan’s Smokehouse in 1930. Sonny Bryan ran his restaurant from 1958 until he sold it in 1989. When the restaurant was sold, the new owners started building the other restaurants, but this one on Inwood is the original and looks very similar to what it did in 1958. I got to the restaurant just before 9:00 on a Monday night. There were a couple Dallas Police cruisers parked outside which I always like to see. Police officers know all of the best places to eat in town. I pulled into the parking lot then tried to figure out where the entrance actually was. There was a door near me that was open, but that looked like it opened into the kitchen. Turns out, it didn’t. It opens into the the order area and I could have used it, but I went to an opening between the two buildings and found a screen door there that led me into the order counter. The guy taking the orders didn’t really talk much…or at all. He just kind of grunted at me when it looked like I was done reading the menu which was above the counter. I was definitely ordering brisket but I always like to try as much as possible. They had the option for combo plates that come in either 1/2 or 3/4 lb. 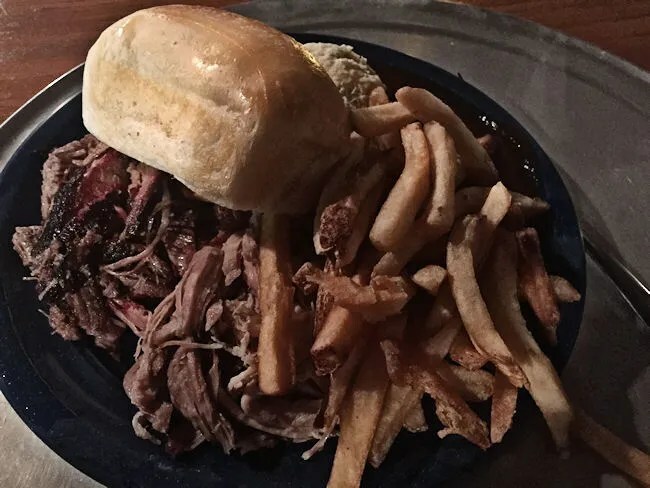 I didn’t want to be too much of a pig, so I ordered the 1/2 and chose sliced brisket and pulled pork as my meats then french fries and potato salad as my veggies. The plate also comes with one of their fresh baked rolls. The meal set me back a little over $16 with a Coke to drink. The one thing the cashier did ask me was for my initials so they could call out the order when ready. In the mean time, I grabbed my Coke and also a bottle of BBQ sauce off the warmer. 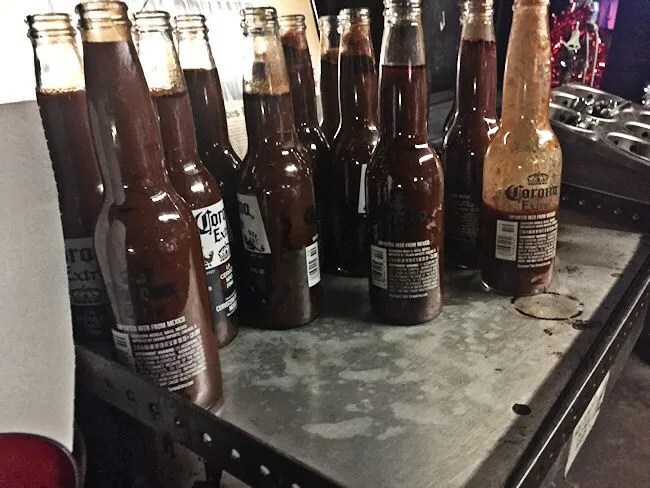 Instead of using plastic squeeze bottles, they use old Corona bottles and keep them on a warming tray. It really didn’t take long for my order to be called. Just a couple minutes after putting it in, the grumpy cashier called my initials and handed me a big tray of food. Now the question. Where to sit? 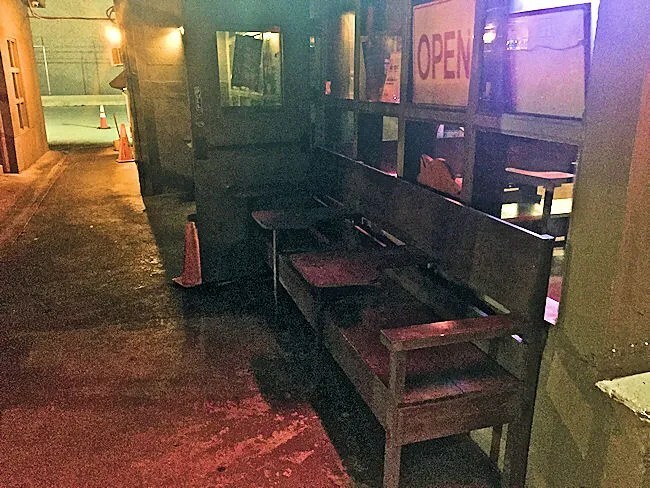 The original part of the Sonny Bryan’s building is a small dining area right off the order area. The really cool thing about this part of the building is there aren’t any tables. Instead, there are old school desks. You know, the kind where you slide into the desk and there’s a small wooden area, usually on the right side, for your to write on. 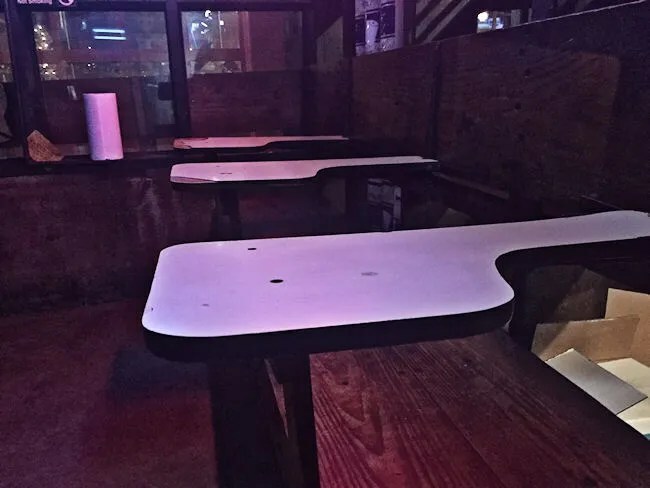 A lot of these desks had names above them as being permanently reserved for regular customers. There was one guy sitting at “his desk” and chowing down on some ribs when I went in this area to look around. The other dining area is much more traditional. It’s in a separate building connected to the original building with a little breezeway. They actually call this the Mercedes Room and it’s used for private parties. It was open on this night I was there so I went in. 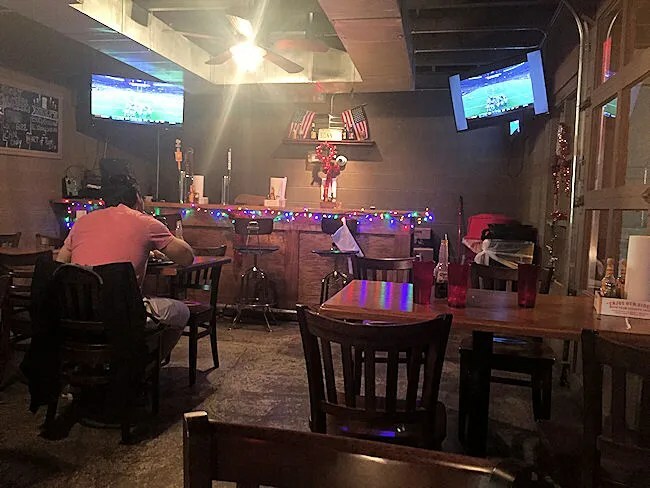 This dining room has actual tables as well as a full bar and some TV’s which were popular since the Cowboys vs. Lions game was on at the time I was there. I actually ended up sitting in this area just because it was a little brighter and I did have a little interest in watching the game on TV since I had already missed a good chunk of it during my travels. 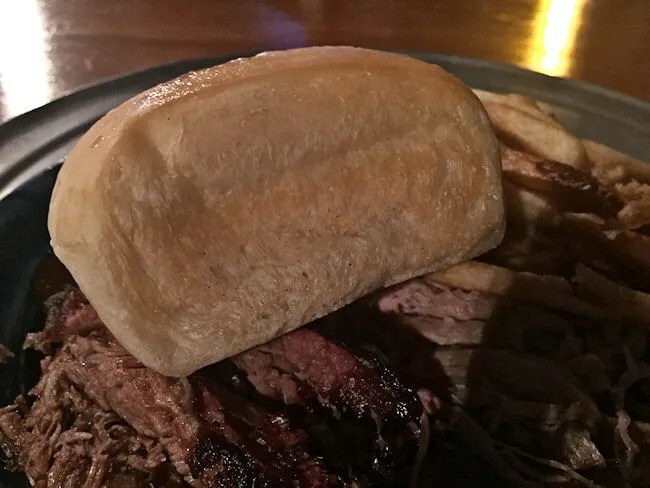 I was in Texas so Texas brisket was what I really wanted on this trip. 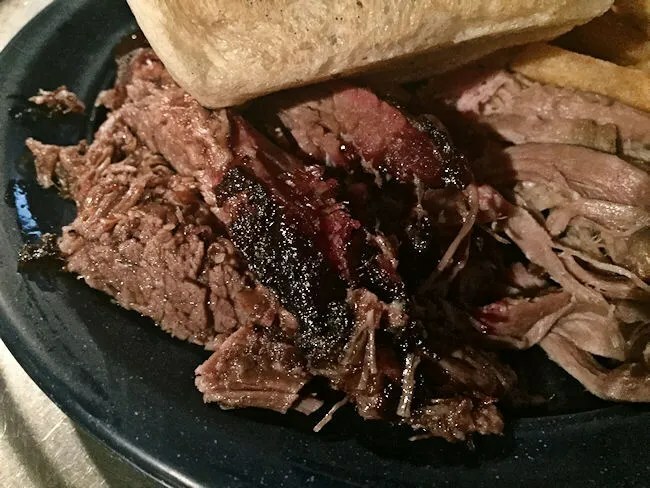 I started in with the brisket and it was everything I’d hoped it would be. It was soft, salty, juicy, and falling apart the minute I picked it up. There was a really good bark on the outside which gave it a really salty flavor. The only thing I really wanted on this trip (food wise) was delicious brisket and I found it within my first hour of being in Dallas. When the brisket was gone, I moved on to the pulled pork. I make pulled pork a lot at home and I’m really picky. This one lived up to my standards. It was juicy. It was tender. It was full of flavor. I didn’t need any sauce or bread for this meat. I’ve been more of a brisket guy recently, but this pork is one I could sit down and just eat plate after plate of. At this point, the sides were an after thought. The potato salad wasn’t really my thing, so I stopped after one bite. The fries however served as the perfect vehicle for the sauce. 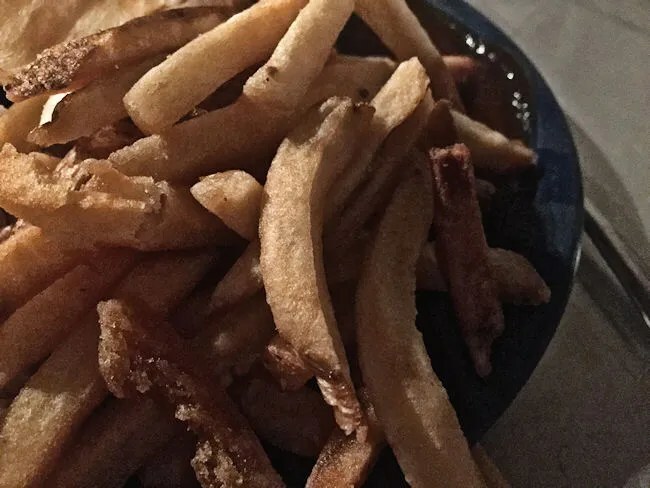 The fries themselves were golden brown, skin on fries which I usually like…and I did like, but really, I was using them just to mop up all the sauce I didn’t use on the meat. The sauce was very thin and very sweet. I love sweet sauces and even more so when they have just a little bit of a kick to them like this one did. I would have eaten the fries on their own, but why? The sauce was a perfect marriage with these golden brown potatoes. The last thing on my plate was the home made roll. It’s a soft, flaky roll with a buttery outside. It’s very similar to dinner rolls served at a number of chain steak houses, but this one is much bigger and fluffier. It’s a nice way to end the dinner and just mop up some of that leftover sauce still on the plate. If I were to base my whole perception of Texas on the first stop I made, Texas is awesome. 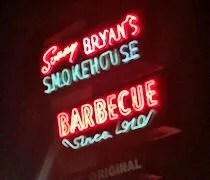 Sonny Bryan’s is the kind of BBQ place I think of when I think of Texas BBQ. It’s simple yet delicious. 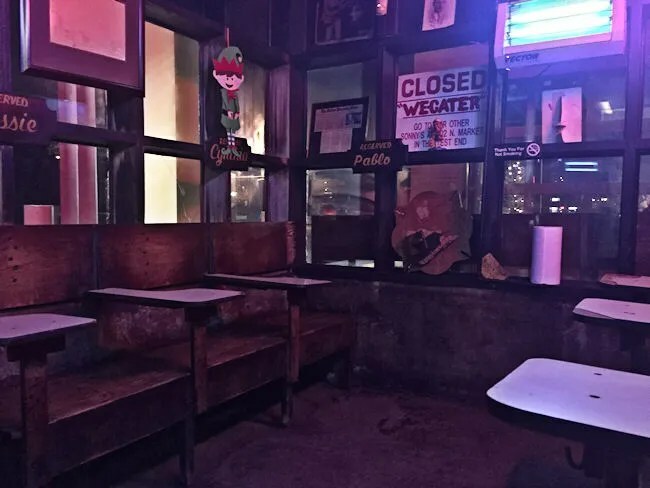 The atmosphere of the place is unbeatable with the old neon sign out front and the school desks for tables in the original dining room. I’m actually a little surprised at myself that I never went back at any point in the week I was there.